MackinVIA Administrators can set checkout limits, hold/loan periods, and renew options to fit the needs of their school or library. To activate checkouts and requests, first log into your MackinVIA Administrator account with your Mackin.com email address and password. Confirm the buttons next to Checkouts and Requestsread Enabled. If the buttons read Disabled, click to enable them. If checkouts are disabled, requests are automatically disabled, and any active checkouts will run their course. If requests are disabled, all active requests will be discarded. If the Backpacks feature is disabled, checkouts and requests cannot be enabled. You can set the loan period for checkouts from 1-21 days. Enter the desired number of days and click the Save Changes button. You can set the checkout limit from 1-99 resources. Enter the desired number of resources and click the Save Changes button. You can set the number of renewals allowed with a maximum of up to 3 times. 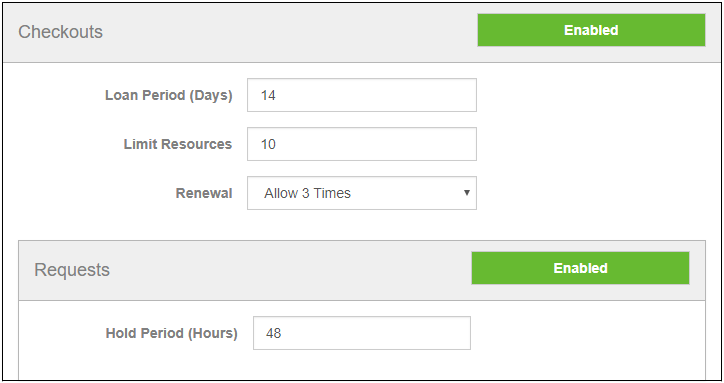 Click the dropdown menu to select the desired number of renewals.To disable the option to renew resources, choose Not Allowed. Click the Save Changes button when you’re finished. You can set the hold period for requests from 1-99 hours. Enter the desired number of hours and click the Save Changes button.